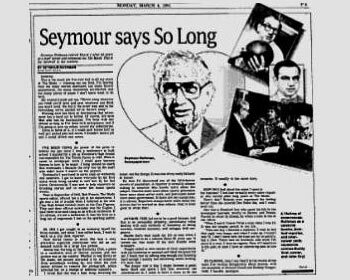 In an excellent story about the history of horse racing in Toledo on Sunday, Feb. 13 (one I had hoped to do at some point when I wrote about Raceway Park) , I was delighted to see reporter Matt Markey called up and interviewed “a fixture” at the track: Seymour Rothman. I didn’t know he was a railbird, but I did know he was a fixture at The Blade. 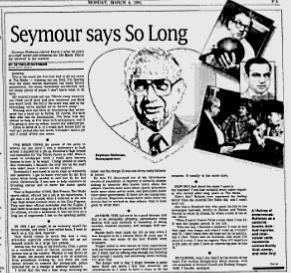 He retired in 1991 after 53 years there, he’s in his mid-90s now (if I did the math correctly from this column from 2006 by The Blade’s Dave Hackenberg), and it’s worth recalling the outpouring he got in print when he retired. The farewell from March 4, 1991. Rothman did all sorts of things at The Blade: he was a sportswriter. A columnist. He did “I’ve Heard,” the column about little tidbits and slice-of-life items, for a long time. In the 70s and 80s he wrote a column about televised sports, “Electronic Press Box.” Wrote features. Wrote news. Did it all. This was his farewell to readers on March 4, 1991. He recounted his career this way: he applied to be the Woodward High School correspondent for The Times in 1929. He was eventually hired on to carry copy, and was soon covering stories and “lesser sports events.” He was offered a job in The Blade’s sports department in 1936, and laid off and rehired in 1938, which is when his 53-year tenure began. Technically, though, he put in over 60 years at Toledo newspapers. In the interests of full disclosure: When I was a child, in the 60s and 70s, Rothman lived around the corner from me at Cheltenham and Darlington roads in the Old Orchard neighborhood, right across the street from Old Orchard School. Finally, I appreciate the fact that when word of my retirement got around, nobody said it’s about time – even though it’s about time. Take good care of my newspaper. Update: Dave Hackenberg caught up with Rothman on the occasion of his 98th birthday May 18, 2012, and wrote about it here. Always great to see. UPDATE: On June 4, 2013, Rothman died at the age of 99. Here is his obituary from toledoblade.com.